Soon after our distant ancestors started to migrate from east Africa, they discovered the rich harvest to be obtained from the sea, and the benefits of living on the coast. For hunter-gatherers the rich coastal ecologies were ideal. They would also have quickly realised that the coasts of the world are prone to storms: from brief, violent squalls which blow in from nowhere, to hurricanes and their relatives. Some of the earliest coastal landscapes showed dramatic scenes of shipwreck, a familiar sight to those who lived and worked around the coasts as maritime trade grew. Alessandro Magnasco (1667–1749), Landscape with Stormy Sea (c 1718-25), oil on canvas, 93 x 130 cm, National Museum of Western Art, Tokyo. Wikimedia Commons. By the early eighteenth century, landscape artists were starting to paint views of the coast during storms, such as Alessandro Magnasco’s Landscape with Stormy Sea, which was painted between 1718-25. Born and resident in Genoa, he would have been very familiar with the storms of the Mediterranean, and their short, steep seas, just as he showed here. 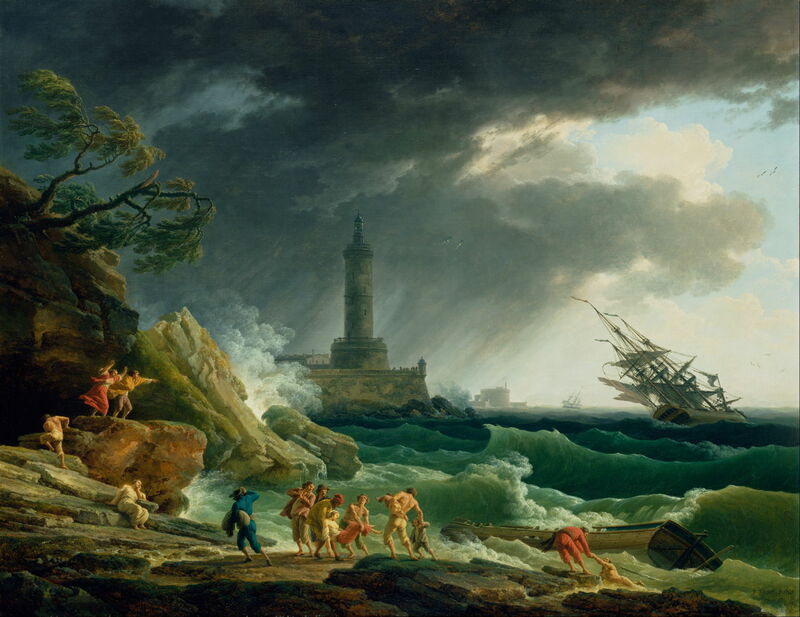 Claude Joseph Vernet (1714–1789), A Storm on a Mediterranean Coast (1767), oil on canvas, 113 × 145.7 cm, J. Paul Getty Museum, Los Angeles, CA. Wikimedia Commons. 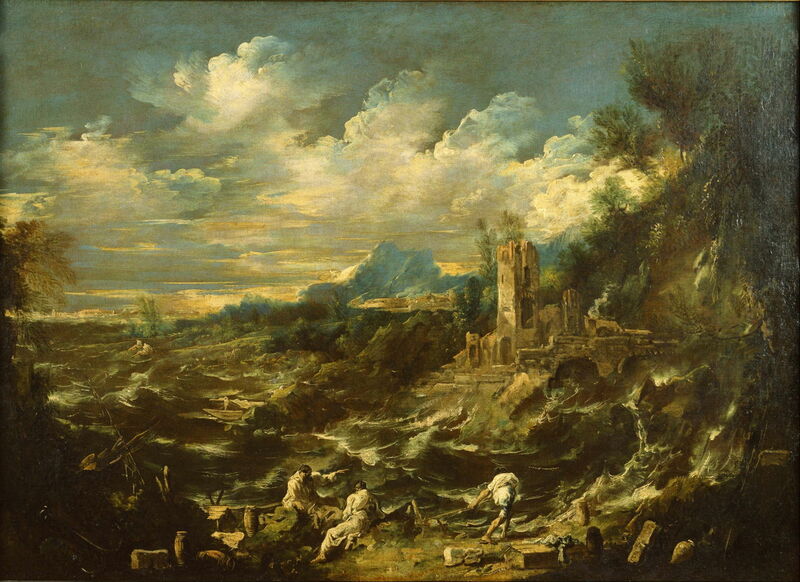 Claude Vernet’s A Storm on a Mediterranean Coast (1767) combines a wrecking with keenly-observed signs of the weather, including the coincidence of reflected and oncoming waves just off the small beach, and the trees at the upper left. Although this was painted in the studio, Vernet probably worked from sketches which he had made during storms. John Constable (1776–1837), Weymouth Bay with a Storm Approaching (1818), oil on canvas, dimensions not known, Musée du Louvre, Paris. Wikimedia Commons. 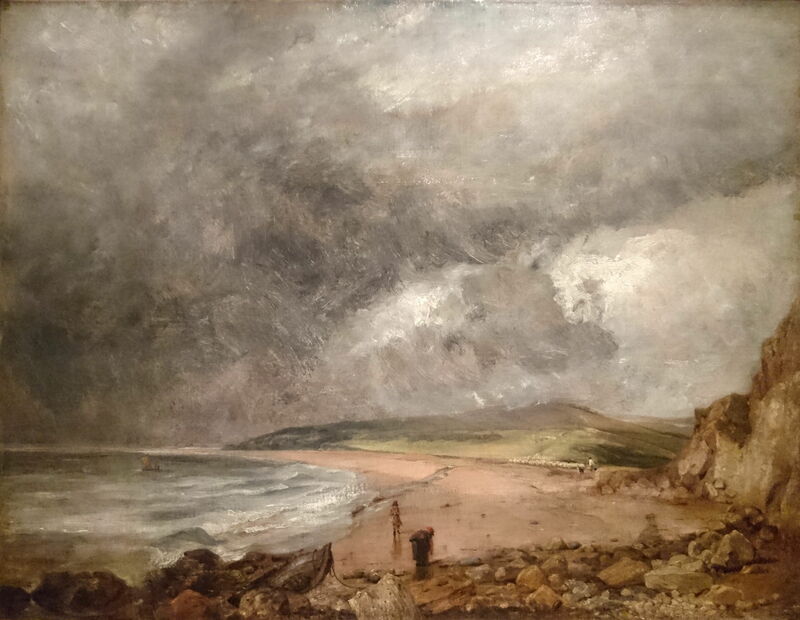 John Constable honeymooned on the south coast of England in 1816, and after that returned to paint around several of its resorts, including Weymouth and Brighton. Weymouth Bay with a Storm Approaching (1818) was most probably painted out of season, judging by the few people on the beach, and shows a storm coming up from the south-west. John Constable (1776–1837), Seascape Study with Rain Cloud (Rainstorm over the Sea) (1824-28), oil on paper, 22.2 × 31.1 cm, Royal Academy of Arts, London. Wikimedia Commons. 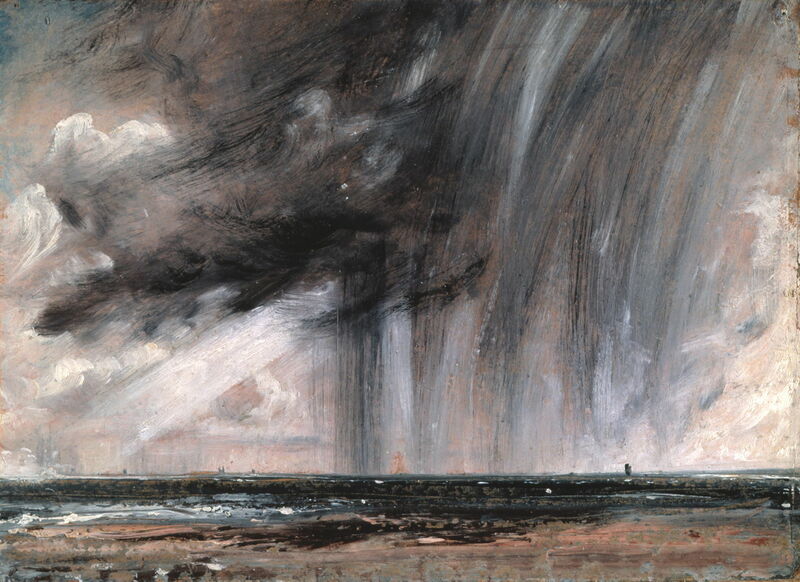 Constable also sketched transient changes in weather, for example in this Seascape Study with Rain Cloud or Rainstorm over the Sea (1824-28), painted in oil on paper. This was a form of the ‘skying’ which he maintained through much of his career, and demonstrates how painterly he could be in his private sketches. George Chambers, Senior (1803-1840), Port on a Stormy Day (1835), oil on canvas, 33 x 45.7 cm, Yale Center for British Art, New Haven, CT. Wikimedia Commons. 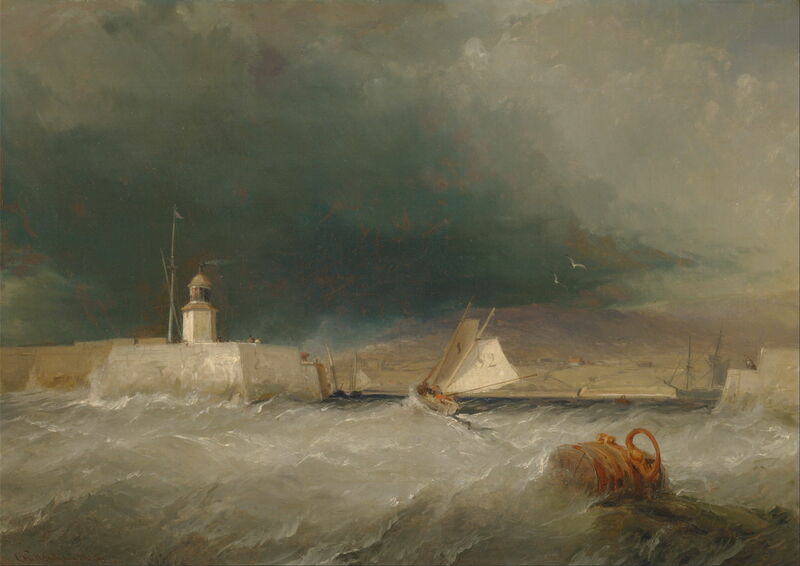 A more typical finished painting is George Chambers’ Port on a Stormy Day (1835). Chambers, the son of a seaman, was born in the port of Whitby in Yorkshire, England, and started working on boats when he was only eight. His talent for art was recognised, and by about 1831 he counted King William IV and Queen Adelaide among his patrons. He specialised in maritime views, but died shortly after he turned thirty-seven. Both his sons became successful maritime artists. 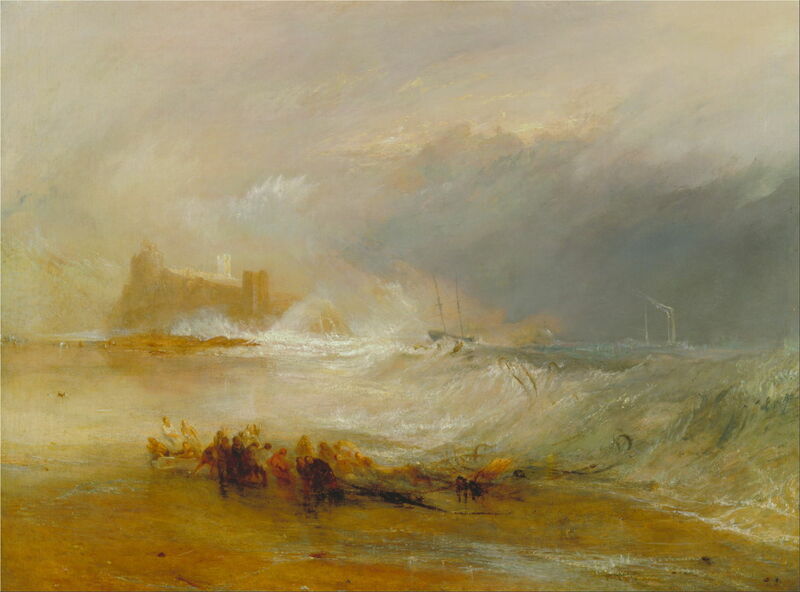 The greatest British nineteenth century painter of coastal scenes was JWM Turner, who was always one for a good storm. Some of Turner’s earliest successes were coastal views, including his Fishermen at Sea (1796), his first oil painting to be exhibited at the Royal Academy, and recognisably influenced by Vernet. Turner’s Wreckers – Coast of Northumberland, with a Steam-Boat Assisting a Ship off Shore (1833-4) shows a more sinister aspect of life on the coast in the early nineteenth century: locals working together to lure ships onto rocks, so that their cargos could be stolen. Turner’s Snow Storm, Steam Boat off a Harbour’s Mouth from 1842, shows well the progressive dissolution of form in his later works. In most of his paintings of storms, Turner invoked vortices rather than the more linear streamlines used by most other landscape painters, which give his storms a distinctive appearance. 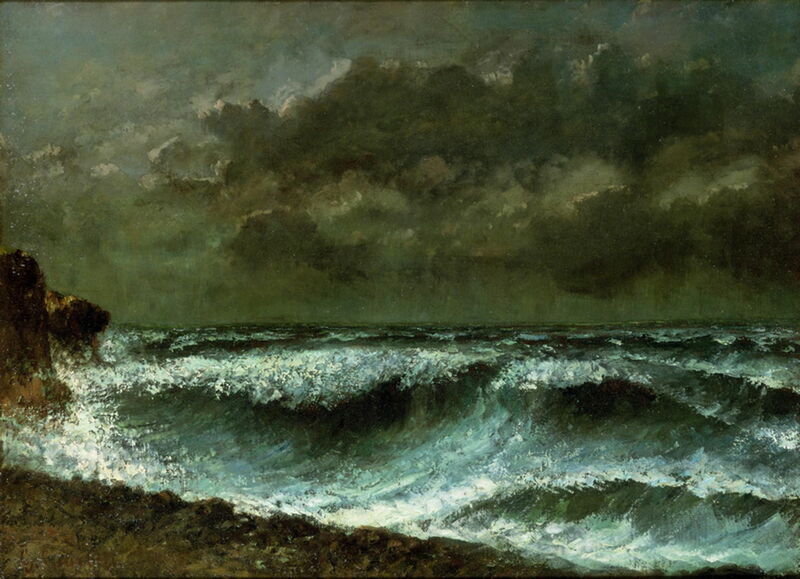 On the other side of the (equally storm-ridden) Channel, in the later years of Gustave Courbet’s career he developed a penchant for painting stormy coasts. Shortly before his ill-fated involvement in the Paris Commune (which resulted in his exile), Courbet painted a series of canvases showing waves breaking on a rocky coast, including The Wave (1869). Gustave Courbet (1819–1877), Squall on the Horizon (1872-73), oil on canvas, 53.6 × 72.4 cm, 東京富士美術館 (Tōkyō Fuji bijutsukan) Tokyo Fuji Art Museum, Tokyo, Japan. Wikimedia Commons. 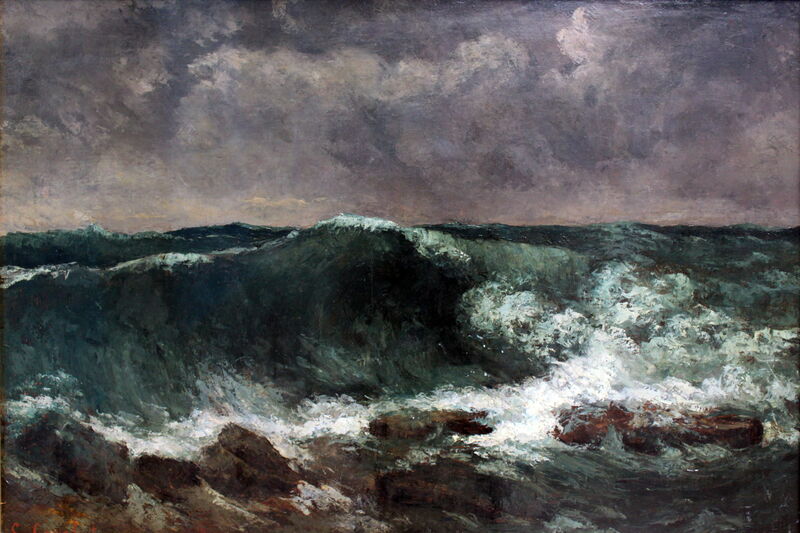 Shortly after he was released from prison following the Commune, he painted further variations on this motif, including Squall on the Horizon (1872-73). In 1873, he was forced into exile in Switzerland, where he died of liver disease at the end of 1877. 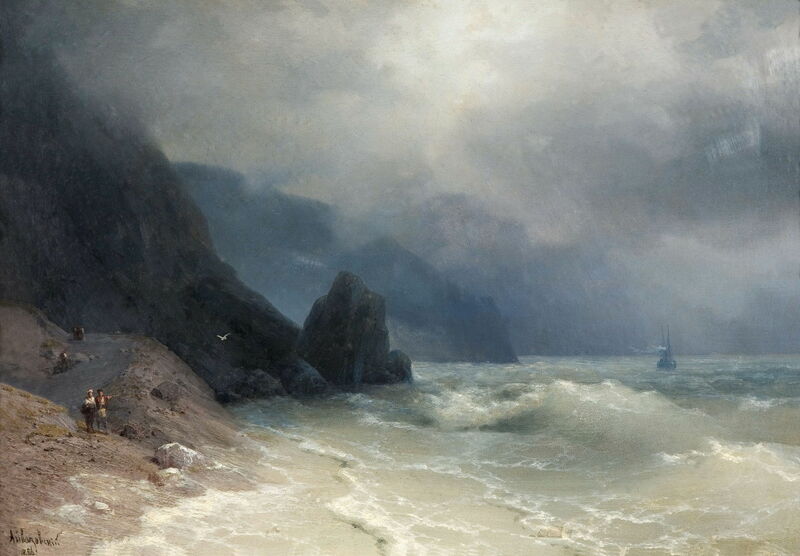 Ivan/Hovhannes Aivazovsky (1817–1900), The Tempest (1857), oil, dimensions not known, State Tretyakov Gallery Государственная Третьяковская Галерея, Moscow, Russia. Wikimedia Commons. Perhaps the most prolific painter of maritime works ever, the Ukrainian (then Russian) Ivan Aivazovsky preferred painting storms and waves in the open sea, but sometimes came close enough to land to show the coast. 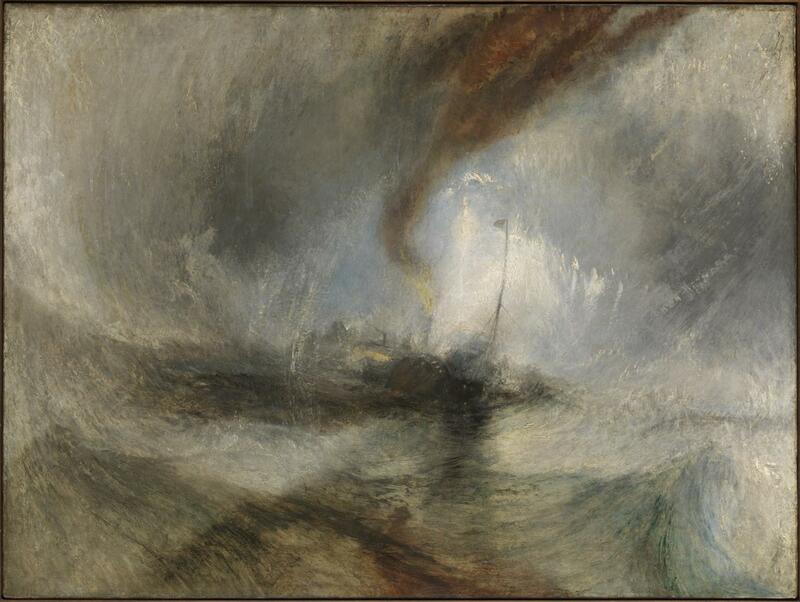 The Tempest (1857) shows, as in Turner’s works, how storms dissolve the boundaries between sky, sea, and land. 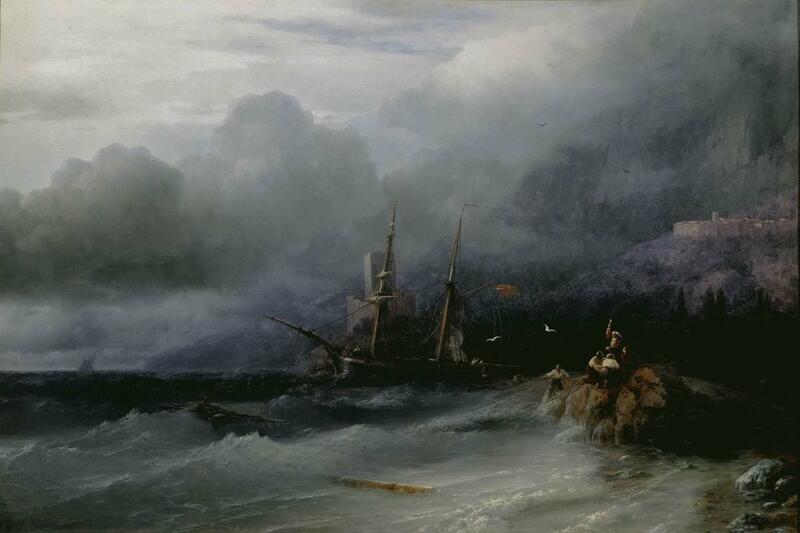 Aivazovsky here refers to the older tradition of including a wreck, with a survivor being rescued from flotsam in the foreground, and a brigantine being driven onto the rocks. Ivan/Hovhannes Aivazovsky (1817–1900), Sea Coast Будинок (1886), oil on canvas, 46.5 x 67 cm, Aivazovsky National Art Gallery Феодосійська національна картинна галерея імені І. К. Айвазовського, Feodosiya, The Ukraine. Wikimedia Commons. Aivazovsky’s Sea Coast (1886) is even more atmospheric, and shows an early steamship with sails in the distance – a sign of the changing times. Posted in General, Life, Painting and tagged Aivazovsky, Chambers, Constable, Courbet, landscape, Magnasco, painting, Turner, Vernet. Bookmark the permalink.